In the past 15 years, carpal tunnel syndrome has become a “catch-all” diagnosis for any wrist or hand pain. True…it is a very common issue; however, there are specific symptoms which classify your hand issue as carpal tunnel syndrome (CTS). There are also several different mechanisms of injury that can lead to CTS. Surgery may be the first treatment that may be recommended by your friends and even your doctor for CTS, but did you know that there are more conservative ways to relieve your symptoms? Before we dive into causes, symptoms, and treatments, let’s talk about what CTS actually is. CTS is the compression of the median nerve as it travels through the carpal tunnel of the wrist from the forearm into the hand. The carpal tunnel itself is a narrow tunnel made up of three carpal (wrist) bones that form an arch. Nine flexor tendons of the hand and the median nerve pass through this arch. The transverse carpal ligament closes off the arch securing the contents in the tunnel. The median nerve supplies sensation to the thumb, index, middle and half the ring finger on the palm side of the hand. It also innervates muscles in the hand which allows the thumb to move away from the fingers, as well as cross the thumb over the palm to touch the pinky. Carpal tunnel syndrome has many different causes, including anatomical variants, overuse injuries, and even fluid retention. Narrowing of the carpal tunnel itself can also be a result of the misalignment of one or more of the carpal bones that form the tunnel. The carpal bone misalignment most commonly associated with CTS is when the lunate bone shifts forward thus reducing the size of the tunnel. Enlargement of the tendons enclosed in the tunnel can also cause narrowing. This enlargement occurs with injury or overuse of the tendons caused by repetitive motions with the hands, such as using hand tools like a screwdriver or wrench, continuously holding tools that vibrate like dental tools or a drill, or even from constant typing without ergonomic support for the wrists. Certain conditions, such as pregnancy, menopause, diabetes, obesity, and hypothyroidism, can cause fluid retention in the extremities. 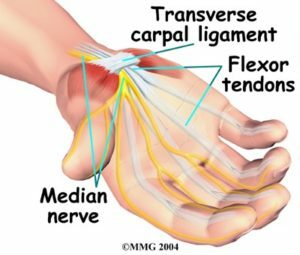 If fluid is retained in the hands or wrists, it can increase the pressure in the carpal tunnel causing compression of the median nerve. Symptoms of CTS are specific and often allow for easy diagnosis. In a case of CTS, you will have paresthesia (or altered sensation, such as numbness, tingling, burning or itching) in the thumb, index, middle, and half the ring finger on the palm side of the affected hand. You could also experience weakness in the muscles of the thenar region (thumb side) of the hand which decrease grip strength and make fine movements of the hand difficult. In severe cases, you will also notice atrophy (or wasting) of the muscles in the thenar region due to improper function of the medial nerve and disuse of the affected muscles. There are several treatment options for CTS. The most commonly known option is surgery. However, there are more conservative treatments to consider before deciding on surgery, including physical therapy, bracing, and chiropractic care. Physical therapy will provide exercises to help strengthen and support the wrist and hand. You may also be given nerve flossing techniques that will promote proper gliding of the nerve through the tunnel which can clear the nerve of any adhesions connecting it to surrounding tissues. Bracing/Splinting is another option to consider when trying to avoid surgery. Braces are usually recommended for use while sleeping to help the wrists stay in a more neutral or slightly extended position. As we sleep, we have a tendency to curl our wrists in toward our body which can cause compression of the median nerve thus producing CTS symptoms. Braces are not to be worn all the time though because they can hinder proper movement on the wrist and hand which will weaken the muscles. The most diverse conservative treatment option for carpal tunnel syndrome is chiropractic care because there are many different techniques chiropractors can use to help alleviate symptoms. For example, a chiropractor can perform an extremity adjustment to the carpal bones of the wrist to create more space in the carpal tunnel. The chiropractors at Pro Chiropractic are all well trained in several different soft tissue techniques that can help reduce swelling, inflammation, and adhesions in and around the carpal tunnel which will relieve symptoms of CTS. We are also trained in different taping techniques that may help reduce swelling, help decompress the inflamed tissues, and provide support to the wrist and hand if necessary. And just in case you need another reason to see a chiropractor for CTS, we can also provide strengthening and stabilization exercises as well as nerve flossing instruction similar to what you would get when visiting a physical therapist. Don’t live another day with pain, numbness, tingling, or weakness in your hand and/or wrist! Call Pro Chiropractic today!! !